This was Trump's gripe, no one is going to invade this country but if they did or Montenegro which was the example, would we really want to send soldiers? Kay Bailey Hutchinson in the photo, Trump appointee, correct? 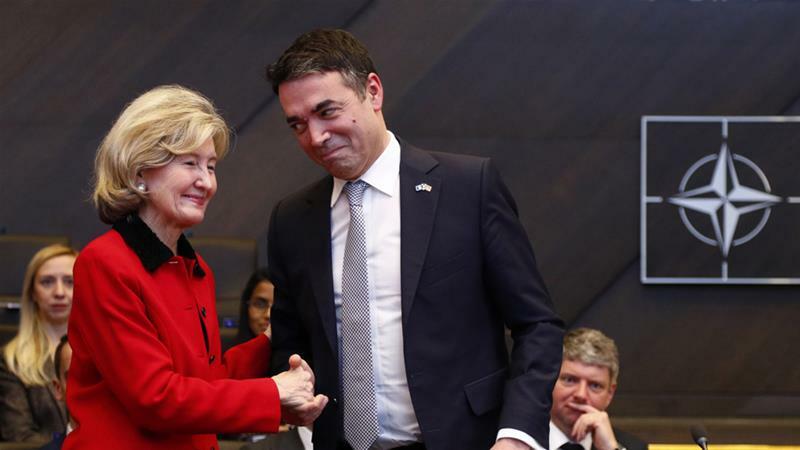 NATO members signed an accord with Macedonia on Wednesday allowing the tiny former Yugoslav republic to become the 30th member of the US-led alliance after a deal with Greece ended a 27-year-old dispute over its name. Macedonian Prime Minister Zoran Zaev said it was a "great, historic day for all our citizens". "Today, the largest security alliance in the world, NATO, has welcomed us," he wrote on social media. "We have provided lasting stability for our country." Some articles are still calling it "Macedonia", no, it is now "Northern Macedonia", that's why I picked this article. No one will invade it... otoh, it is the Balkans, the birthplace of WWI and has been the region of numerous other incidences in history. I assume it won't happen again.....never say never, safe for now. The renaming was over a silly quibble with Greece. Why should I give a flying f**k in what Russia thinks.